For me, the thought of mandarin oranges conjures up the image of those tiny, insipid, segmented pieces of fruit found in cans that are added to fruit salads and ethnic entrees. But mandarin, in its own right, stands out as a very therapeutic as well as wonderfully aromatic essential oil, highly prized not only in China, but throughout Europe as well. Its actions are antiseptic, antispasmodic, carminative, digestive, diuretic sedative and tonic. Mandarin essential oil is extracted by cold expression from the outer skin of the citrus reticulata fruit. It has an incredibly sweet, (almost floral) citrus scent and has been used in soaps, cosmetics, colognes and skin care products. It is also used in confectionary as a flavoring agent, and in soft drinks and liqueurs. In skin care, it is an excellent cleanser and is useful with clearing acne, blemishes, scar tissue, stretch marks and in normalizing oily skin and clogged pores. 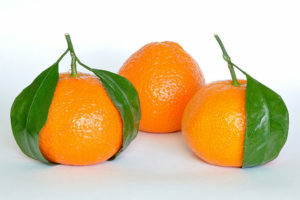 Mandarin essential oil, added to a toner, can increase the efficacy of the toner by balancing the pH of the skin. It helps cleanse the eliminatory channels by reducing fluid retention and flushing toxins out of the system. Mandarin also encourages cleansing and strengthening of the liver, which makes it a perfect oil to use in the springtime, which in Chinese Five Element theory, is the best time to do a liver cleanse. Massaging mandarin essential oil in a carrier oil, in clockwise circular motions over the liver area, will help stimulate the liver to detoxify stagnation that has settled there from the winter, and tonify it for the upcoming season of renewal. Used as a digestive aid, mandarin can also help with dyspepsia, hiccoughs, indigestion and intestinal problems. It is especially supportive digestively for the elderly and for children because it is non-toxic and non-irritating, but very soothing and calming. For children, mandarin burned in an aroma lamp assists in placating a fretful child, by stilling the restlessness and nervous tension. It encourages a peaceful tranquil sleep by fighting fidgety insomnia. In meditation, mandarin can bring on a deep quiet restful state, balancing one’s inner sense of harmony and peace. It can help evoke images and visions and assist in one’s quest for inner wisdom and truth. It is a sensual oil, and when combined with other aphrodisiac essential oils, can bring a deep sense of self-acceptance and self-awareness. Mandarin’s guidance can lead one down paths of inner awakening – perfect for this new era of higher frequency energies. Mandarin assists with our alignment to the new grid of energy that is presently being placed over the aura of this Earth, helping to bring us into the dawn of this new age.